The national assembly is reportedly set to reject President Muhammadu Buhari's request of approval for a N4.2 trillion bond. According to a Vanguard report, some strong indications have emerged that fresh crisis may loom between the presidency and the executive as senators are poised to reject the request of President Muhammadu Buhari for the approval of a N4.2 trillion bond. It was gathered that the senators had taken this decision before they embarked on Easter break, just as both members of the upper and lower chamber were said to be unhappy that the executive failed to render account of the over N9.2 trillion loans or bonds approved by the National Assembly since 2016. A senator who spoke on condition of anonymity, said the “sins” being counted against the latest loan request are multifaceted, leading to what they described as a near consensus feeling that the request be rejected. 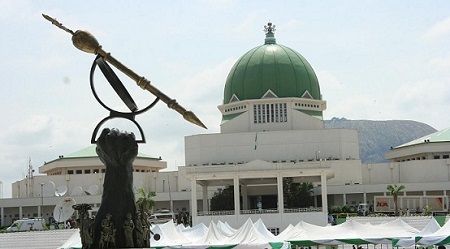 If will be recalled that President Buhari, had in separate letters read in the House on Tuesday March 27 and in the Senate on March 28, requested for approval of a fresh N4.2 trillion bond. One of the perceived sins of the President, according to lawmakers, was that he forwarded such a request without prior discussions with them.